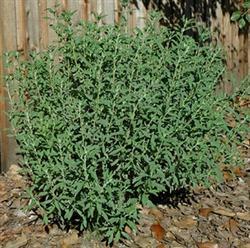 This sage was developed at Rancho Santa Ana Botanical Gardens and is most likely a cross between White sage (S. apiana) and Black sage (S. mellifera). Starlight is fast growing shrub to about 4' x 4'. It has silvery green foliage which causes the spring and summer blooming white flowers to stand out and sparkle like stars. It is very attractive to hummingbirds, butterflies and native pollenators. It does best in full sun and only needs occasional to no extra water.